At 7:29 p.m. on January 24, 2019, the riders on a bus traveling east on Route 80 in Parsippany were texting, looking at social media sites, napping and excited to be most of the way to their destination. Tragically, at 7:30 pm, this changed in a blink of an eye. At that instant, their bus collided with the highway median, launched into the air spun into three cars. One person was killed and thirty-six injured. Sadly, we hear stories such as this frequently in New Jersey. Because of the many commuters who ride buses to New York City, Philadelphia and Newark for work each day, buses are nearly three times more likely to be involved in a large vehicle accident in New Jersey than the national average. Each day, tens of thousands of our residents ride buses to work, school, shopping or leisure. For many commuters, a bus may be their only method of getting from Point A to Point B. With so many buses on the roads, accidents are doomed to happen. According to statistics from The National Highway Traffic Safety Administration (NHTSA), hundreds of individuals are hurt from bus accidents daily, while 500 people are killed in bus accidents every year. A bus accident that occurs in the Garden State that happens to involve the New Jersey Transit can be complicated when it comes to filing a claim. 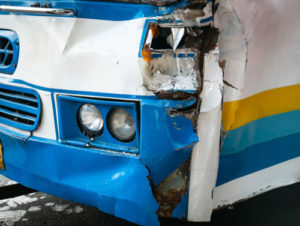 The reason for this is because the window for filing a claim is limited when compared to other bus-related accidents. It is important that bus accident victims contact an attorney as soon after the accident as possible to preserve their rights. The failure to file a lawsuit within a short time frame can potentially make it impossible to ever recover for these injuries. While these behaviors are a big no-no for those behind the wheel, bus drivers can’t be blamed for all bus accidents. Both bus company manufacturers and maintenance companies can contribute to bus accidents, as well as passengers. All of the passengers on the bus, in addition to any other drivers or pedestrians are unfortunately at risk-for accidents that result from these kinds of situations. Do I contact the bus company’s insurance carrier? If I’m out of work, how will I be compensated? How will I pay for my medical care? If I Need Compensation, Will the Bus Company’s Insurance Provide This? While there are some bus companies that require that they carry insurance to cover the medical treatment of any injured passengers, not all have this luxury. A bus accident attorney is apt in answering this kind of question and will see to it that your medical bills are submitted to the appropriate insurance company. A personal injury lawyer will also help you in handling all of the necessary, and sometimes tedious, paperwork that is required for you to recover compensation for your injuries. Regardless of whether or not you know for certain that a bus company or driver is legally responsible for your personal injury, contacting a skilled attorney helps to ensure your rights are protected.